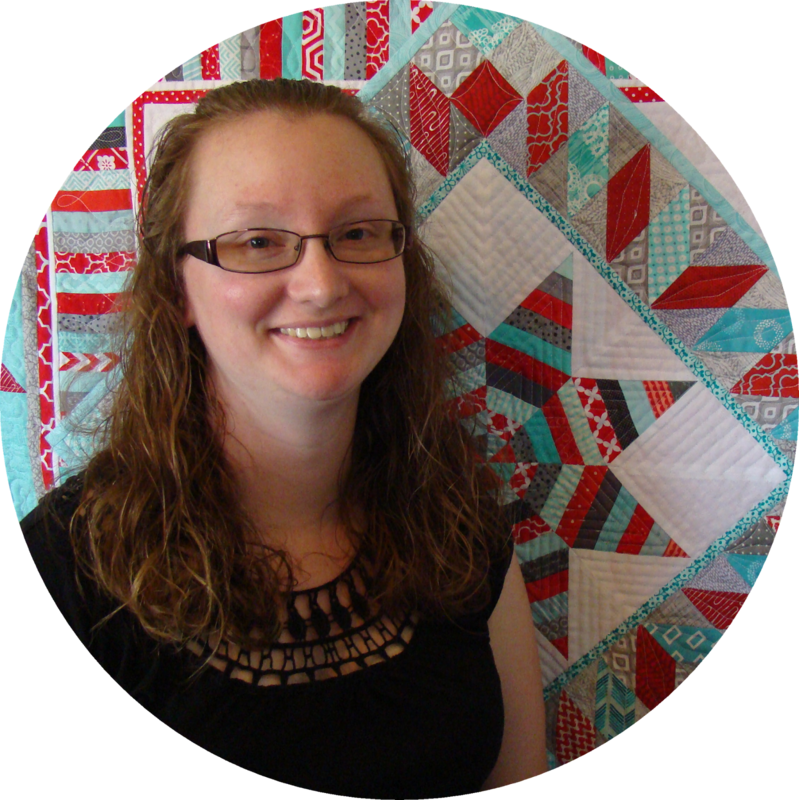 Slice of Pi Quilts: It's Giveaway Day! The first pattern is for Snowfall, a fat-quarter friendly pattern suitable for advanced beginners. I love the ombre effect and metallic sparkle that these fabrics have! A real favorite in our house this winter! Second, is Split Arrows. This pattern is perfect for small and medium scale prints. It works great for fat quarters too! 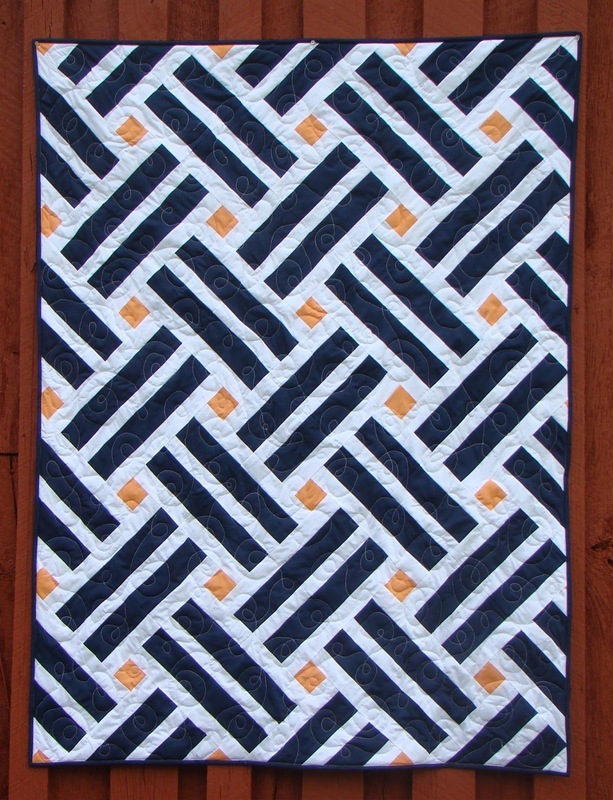 I loved working with the organic Birch Fabrics for this quilt! Next up is a Bookends Mini, a great quilt for using up treasured fabric scraps. 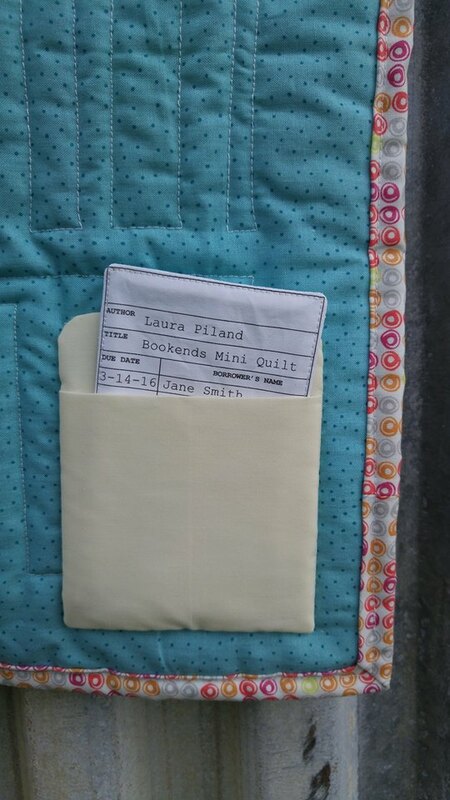 My favorite part of this pattern is the library card and pocket quilt label! The perfect gift for the librarian and book lover in your life! Fourth is Laying Tracks. The perfect quilt for highlighting your two favorite colors. I've started one in Christmas red and green. I know it would look great in your favorite team's colors too! HOW TO WIN: Leave a comment on this post telling me your favorite gift idea for a quilter/sew-er. You must say whether you are US or International. Be sure there's an email address connected to your account or in your comment so I can contact you if you win! My favorite gift was one I made for my best quilty friend, Heather, for her birthday earlier this year. I made a mini quilt in her favorite colors, then had a puzzle made to match! Read all about it here. Thank you for stopping by! You can find my patterns on Etsy and Craftsy. Be sure to find me on social media! I can't wait to meet you! Fabric for any quilter is always the best! Love the Split Arrow quilt! I'm in the US. Fabric or gift cards to a favorite quilt shop. 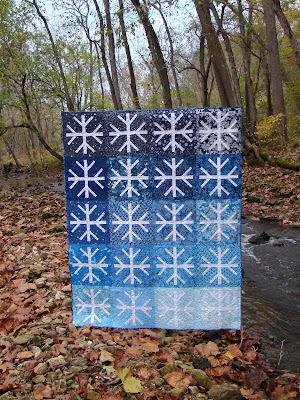 I love the Snowfall quilt. You are an inspiration to me. US - Gift card to the fabric shop. Love Snowfall. US-Fabric of course or some cute sewing notions! If you want a no cost gift find some FQ's from your stash and make a set. If you want a cost gift buy a Zirkel pincushion or a great brass seam ripper, can't beat either one. Fabric from a list of favorites, rotary cutting blades, gift cards or just a weekend without any other responsibilities! USA. Fabric or quilt patterns. 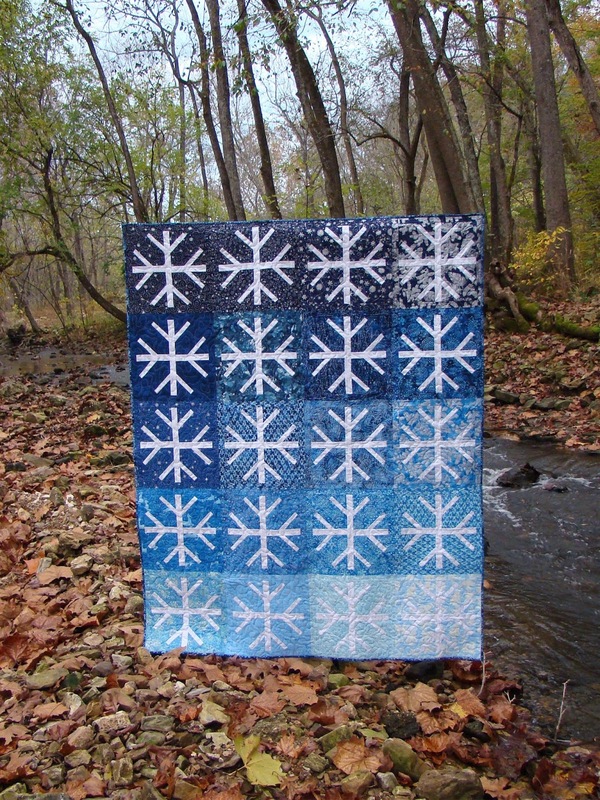 Love the let it snow quilt. I think fabric is always a great gift to a quilter! I love your puzzle idea though! All of your patterns are awesome. USA Fabric or a gift certificate to a favorite shop. I am in the USA. I love give little baskets of notions. Take her kids out for the day. My go to gift is fabric. I would love to this!! more fabric is always the best gift! A new book or pattern to challenge their skills. I am in the USA. I found that gift cards are the best with a little fabric thrown in for fun. I think handmade storage--baskets, needle cases--or something mini for a sewing room wall makes for fun gifts. I'm in Maine, US. I love giving fabric (bonus if I get a little for myself)! I'm in the US. 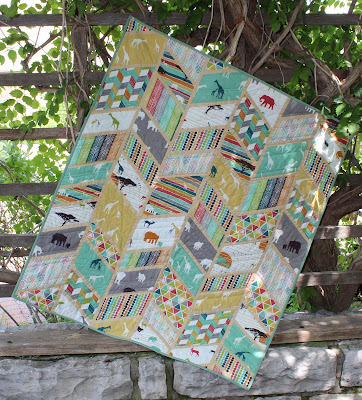 I adore your bookends quilt! Winner winner chicken dinner! You win! Email me to claim your prize! Fabric precut with a cute pattern. Love these quilts and I am based in the US. 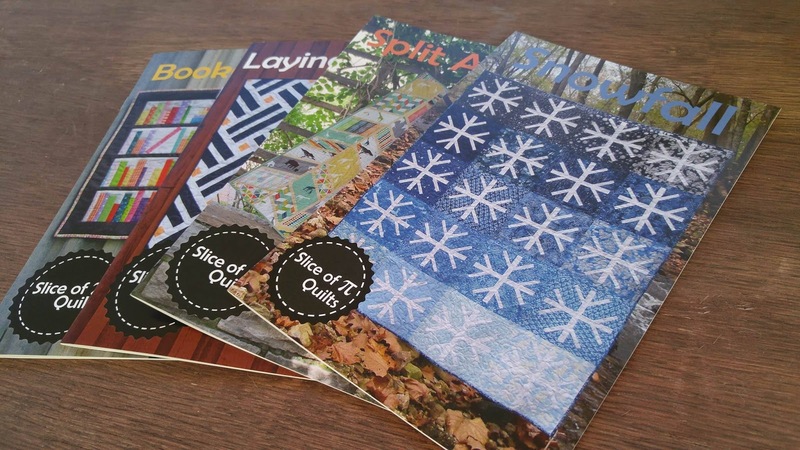 New quilting books or patterns. I'm thinking quilters like fabric most of all but I have given mini quilts embellished with buttons and lace as a gift. The puzzle idea I did for my coworkers one year of a placed I traveled. Now I will add this idea for quilty friends of mine. 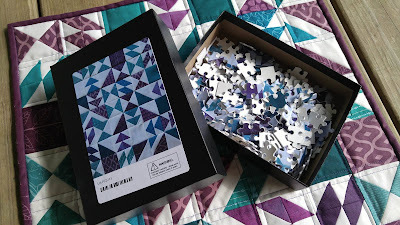 I adore your idea of a quilt with a matching puzzle...how unique! Last year, my husband gave me a year's subscription to a monthly sewing/quilting box. I have enjoyed each one and will miss it in January. Honestly? A gift cert. I LOVE picking out fabric. It's my favorite part. For a handmade gift, a quilt that speaks to me about them. Whether it's colors/fabric/pattern, I try to pick out everything they love or I think they would like. Fabric! Or a little handmade sewing kit. Some nice precuts for sure! Fat quarter bundle. I'm in the USA. I love giving something handmade (zip bags, totes, mug rugs etc) since I also love getting handmade gifts! So simple, but new pins are always a great gift! A gift card to a fabric or pattern shop is a never fail gift. I love to give my quilting friends fat quarter bundles that I make up of fabrics that remind me of them. It's fun to pick them out and then to see them open the package. A bag of scraps which I have run out of clues on what to use them for and they turn it into something amazing. Pincushions or novelty stuff like quilty phrases on prints or tshirts. Some fabric you know they'd love or a gift card to their favourite shop. I'm international. Gift card to a fabric shop! Definitely fabric or some fancy thread! I like to give some goodie that they can use all year long. This year it is going to be a flat thread catcher that sits beside the sewing machine or in your lap for handwork. Fabric...always fabric and maybe thread and an extra seam ripper because we can never find those, can we? Beautiful patterns. US. I like to make a fabric storage basket and pack it with fabric and notions. Canada - I like giving handmade; a sew together bag with some great supplies inside or even a little Lola pouch. Thanks for the chance! I love giving some sort of tool/notion that can be used - like a magnetic pin bowl, fancy pincushion, or kit for sewing on the go. Thanks for the giveaway! I'm in the US. I haven't really had a go-to, but I've been working on getting some pincushions done, so maybe those will become it. I'm making a binding kit for my quilty friends with a spool of thread--room for a spool of thread and needle. I love your snowflake quilt! Love the puzzle idea! I always like to give a set of mini charm packs to my swap partners who like to sew. I also like giving quilty friends mini rope bowls that I make using my scraps. I am in the U.S. Fabric is always a good gift. You can never go wrong with fabric. What great patterns. Thanks for the chance to win. I like to give fabric. Fabric is the best! I'm in the US. Thanks! Fabric is the best gift for a quilter! I just love that puzzle idea! Wonderful. I think fun notions are always a good gift. Cute snippers or seam rippers. And of course fabric is always a good gift. I've made jars with pincushions for sewing notions for my sewing friends. A beautiful box of Aurifil thread! International. I love getting and giving fabric to my quilter friends, it will always be appreciated. I'm in the US. Thanks for the chance. I live in Canada. I like to make a little basket and fill with little things (fat quarter, special notions etc). I am in the US. I would say a one hour basket filled with goodies! 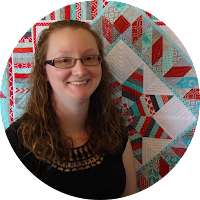 I love to find new and exciting notions to share with my quilting friends. I love your patterns. They are gorgeous. Thanks for sharing. I am in Canada and love to give a gift basket of assorted goodies - wonder clips, thread cutter, seam ripper, etc. Fabric or your favorite notion . Thank you . I'm in Kentucky ! I'm from Canada!!! You can't go wrong giving fabric or a Gift certificate to a fabric store!!! You can go wrong with a nice bottle of wine. I'm from USA. I love DIY projects, this year it is a mug rug snowflake pattern. International. I've only been sewing for a few years and I'm just finishing up my second quilt. I know there are so many neat tools out there, I'm only just finding out about many myself! I know I wouldn't buy them for myself, so I would love to give/receive various quilting ruler/templates! i'm in the US. fabric is always a good gift for sewers of course - or a gift card to a fabric store because everyone loves a reason to buy more! I like making fabric buckets for my sewing friends - you can use them for so many things!! A gift certificate to a fabric shop, they can buy something they really want. U.S. - I love to give Sewline fabric glue sticks. Oh yeah - I also love them myself!! I think making something handmade for a quilter/crafter is fun. It can be intimidating, but I think other crafty people understand the time and planning that went into the gift. I am in the US. Gift cards to quilt-related stores both local or online would be the best gift ever! Minnesota USA. Yes you have picked our 4 of the neatest quilt patterns to win. Thank you for being a part of the SMS Giveaway. I just saw a email that shared a video on how to use wrapping paper to make a card holder. I just thought this would be unique as well as being quite clever. I am from US. Wishing you Happy Holidays. I'm a big fan of mini quilts or new fabric! I like to make tablerunners as wedding gifts. It's easy to find the couple's colors in their registry and it doesn't take weeks to make the gift. I'm in the US. Thanks! The perfect gift for a quilter... well for me is either a fabric bundle or a mini quilt. Favorite gift idea is fabric outside their comfort zone. It is what I ask my children for. A fabric basket with notions or fat quarters inside or a cute pincushion are both nice ideas for anyone who sews. I think a great gift is a current modern quilt block book. I live in the USA. I'm thinking of giving a quilt journal to my quilter friend this year. Live in the good old USA and I love the looks of your snowflake quilt but them my favorite color is blue! Thanks for doing a give-away! My favorite gift is a small pretty tin filled with cute scissors, tape measure, thread, and a mini charm pack. I just bought my friend Joannie an Ott light for Christmas! I think it's a great gift. I'm in the USA. Beautiful patterns! Depending on how long the person has been quilting. For a beginner I always like getting tools to help them get started. For the seasoned quilter I might get a book they've been wanting, a fabric bundle or even a gift certificate so they can shop. International - I always think fabric is the perfect gift but others may prefer a gift certificate! Yes, fabric is wonderful, but it's the thread that holds it together. I've gifted my quilty friends the large size of Aurifil thread- something they might not buy for themselves. I'm in the US. I'll follow you on IG. I am an international. For me a small handmade gift is my favourite, like a pixi basket..fabric is always a good choice too, lol! International. I like sewing mug rugs. I like to give quilting notions and magazines. Im in the US. I love making a small hanging for a quilting friend.